Discover the benefits of lemon! 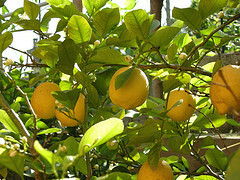 Lemons are yellow, oval, fruit grown on the Citrus limonium tree. They're low in calories and rich in nutrients! Find vitamins B, high amounts of vitamin C, citric acid, carbohydrates, dietary fiber and a small amount of protein in lemons. They're antibacterial, antiseptic and anti-viral with antioxidants benefits! Improve your health, inside and out! 1) Mix 1 mashed banana with a 3 drops of diluted lemon juice. Helps to clear and smooth skin. 2) Mix 1 teaspoon of honey, 1 drop of sweet almond oil and 3 drops of diluted lemon juice for a homemade facial mask. Apply mixture to face, then let stand for 15 - 20 minutes. Rinse with water. Gently dry with towel. Reduce visible signs of pre-mature aging. 3) Drink water with lemon everyday. The benefits of drinking water with lemons can both provide an overall natural, healthy, glow. It helps to purge toxins from blood and purifies skin. Are you looking for ways to clear acne, how to detox or improve your overall skin tone? This is a super easy way to start! The Mayo Clinic suggests the 8 x 8 Rule to drink eight glasses of water, of eight ounce size, everyday. Warm water reduces the size of pores and helps get rid of blackheads. Water replenishes skin tissue, moisturizes, increases skin elasticity and improves blood circulation. Acne may seem to be getting worse, at first, because water or lemon water is flushing toxins out of the body. Clearing acne can be stressful, but don't worry, this condition is only temporary. Acne break outs will less likely occur once the toxins have been purged. Lemon water helps balance the natural pH level of skin. Exfoliate dead skin cells. It has antioxidants benefits! Neutralize free radicals that cause skin damage. Dark spots, discolorations, scars, fine lines and wrinkles can all begin to fade. There are many benefits of lemon water! There are benefits of lemon juice, but it is mildly acidic. This antioxidant juice may sting, temporarily, when applied to skin. Dilute lemon juice, with water, before applying to skin. Apply a small amount to skin, gently, with a soft cotton ball. Helps prevent blackheads, reduce fine lines or wrinkles, lighten dark patches and fade scars. Lemon essential oil is found in commercial and homemade beauty products. It has astringent and moisturizing properties. It helps get rid of blemishes, reduces cellulite, gets rid of dandruff and improve scalp conditions. It is, especially, used in commercial and homemade shampoo for oily hair. Find in scrubs, soaps, lotions, creams, lip balms and more! CAUTION! Lemon essential oil is NOT for internal consumption. Essential oils are highly potent and concentrated. They must be never be used straight, internally or externally. Never apply them directly to skin. They must be diluted or used in a buffering agent like soap, lotion, cream, etc... They contain bioactive compounds. Never use any essential oils without knowing what their bioactive compounds are known to do. Lemon essential oil may be skin irritating for some. Avoid using essential oils if pregnant. CAUTION! Lemon oil can cause photosensitization. Skin can burn and damage easier when exposed to any ultraviolet light, including sunlight. It can be safe to use, with precautions. Example: take a bath with lemon oil, at night, to avoid daylight hours. CAUTION! If you have citrus allergies avoid using lemons, lemon juice or lemon essential oil. Contact your health care provider, if needed. CAUTION! The citric acid in lemons or lemon juice can erode tooth enamel! Dilute with water and monitor closely for dental care or whitening of teeth.